Igor the arctic fox lurched across the tundra, limping from the deadened feeling in his left hindpaw. That paw had never fully woken up when Frankie Mouse reanimated him. The electric surge from the lightning bolt hadn’t made it that far, but Igor was still grateful to Frankie. Without his kindness, Igor would still be lying in an unmarked grave, forgotten and unmourned. Instead, Igor adventured across the tundra on glorious missions in service to the most magnificent mouse throughout the land. Frankie Mouse’s castle rose above the frozen wasteland like a dream. The hewn-ice masonry of the towering turrets and soaring spires gleamed in the waning winter sunlight, a constant reminder of the fealty Igor owed Frankie. Two more miles and Igor would reach the motley collection of freshly dug graves that served as a memorial to Dusky Dillon, a snow leopard who had recently emigrated from Asia to northern Russia and set herself up as a murderous gangster queen. Her reign of terror had ended in a blood bath that concluded her own and a dozen other lives. Frankie Mouse wanted her body. There were no others like it in northern Russia. Her broad back, large paws, and wide muzzle — all put together with a feminine, feline grace — meant she cut the ideal figure for a bodyguard and warrior minion for Frankie. He wanted her body, and he wanted it fresh. He needed it fresh enough to resurrect her. Igor had questioned whether a murderous villain like Dusky Dillon would truly make the best, most trustworthy body guard, but Igor assured him that everyone — even Dusky Dillon — deserved a second chance. Besides, Frankie had pointed out, Igor had done his share of villainous deeds before his own resurrection. Igor couldn’t remember before his resurrection, but he felt bad for questioning Frankie Mouse. Frankie was so wise and patient with him. Igor would make up for doubting him by bringing Dusky Dillon’s body back to the lab before sunrise the next morning. That would make Frankie Mouse happy with him. Under the blanket of dusk, Igor limped into the haphazard graveyard. Flowers in small bouquets, mostly the yellow and white blooms of arctic poppies and snow buttercups, and other tokens such as handmade dolls or tiny flags marked most of the graves. The largest patch of freshly overturned dirt, though, bore no markings — no tokens of love. It had to be the grave of Dusky Dillon. Igor set to work on the cold dirt with his bare claws, scratching and scraping with his front paws; kicking the loose soil away with his hind paws. Dusk deepened to night, and the hole beneath Igor’s paws deepened toward the inanimate feline body buried there. Owls hooted in the distance, and Igor pushed himself to dig faster, harder. He didn’t want to be caught grave-robbing. He ignored the numbness in his paws. Igor’s claws sank, finally, into flesh, cold and dead but soft compared to the hard packed dirt. A villain like Dusky Dillon didn’t rate a coffin, only dirt and good riddance. Igor excavated gently around the dead limbs to avoid damaging the body. Frankie Mouse would prefer it that way. The smell of death filled Igor’s nostrils. It took all of his willpower to continue digging, and, once he finished, it took all of his strength to drag the dead bulk of Dusky Dillon’s body out of her grave. The jumble of cold limbs and dirt-caked fur did not bespeak value to Igor, but his heart swelled knowing that he held in his arms an object that his master dearly desired. Igor draped the leopard body, much larger than his own fox self, over his back and began limping out of the graveyard. Dusky Dillon’s hind paws and tail dragged on the ground behind him. Igor set his eyes on the glowing torchlight along the turrets of Frankie’s castle in the distance. He imagined the grand gala dances and feasts that Frankie must enjoy in the ballrooms. He pictured mice, voles, and hares in regal dress waltzing together, toasting Frankie with spiced wine, laughing and singing inside the ice-hewn halls. Someday, perhaps, Igor would be invited to join them. For now, he let his imagination propel him forward, lightening the weight of Dusky Dillon on his back. Igor heard the owls’ wings flap as they circled above. If they knew he was working for Frankie Mouse, they’d leave him alone, but Frankie Mouse had sworn him to secrecy. No one was to know of his plans for Dusky Dillon. One of owls shrieked inarticulately, and then Igor felt the owl’s body slam into the corpse on his back. He stumbled forward under the added weight and lost his hold on Dusky Dillon’s arms. Tangled in dead limbs, Igor slammed into the ground, knocking the air out of his chest. Igor struggled to right himself, but he was flustered by the flurry of snowy owl wings that filled the dark air around him. The other owl tore at the dead leopard’s head with sharp, angry talons. “Murderer! You killed my hatch-mate!” the owl screamed at the dead body, completely forgetting the fox beneath it. Igor pulled himself out from the fray, but then he realized the damage the owl was doing to Frankie Mouse’s prize. “Nooooo!” he howled. A blood rage filled him, and before thinking he lunged and snapped his jaw of razor sharp teeth on the crazed owl’s neck. One more lunge, and the second owl went down. Igor found himself, dazed, sitting on his tail on the tundra, surrounded by three disfigured and dead bodies. Dusky Dillon’s formerly perfect feline head was savaged beyond repair. Frankie Mouse would be so disappointed in him. If he were a kit, he would have cried. Instead, Igor pulled himself together, hoisted Dusky Dillon’s body onto his back again, and dragged it the last mile to Frankie’s laboratory. All the way, the twinkling lights that played on the ice walls of Frankie’s castle mocked him. He would never be allowed inside with the civilized mice, voles, and hares. He murdered owls and robbed graves. He belonged hidden in Frankie’s underground laboratory forever. Igor descended the stone stairs into Frankie’s basement laboratory feeling like he was crawling into his own grave. His master wasn’t in evidence, so he laid Dusky Dillon’s body out on the largest work table. Igor didn’t feel right leaving the two dead owls lying on the open tundra to rot, so he headed back out into the night. Another two trips across that last mile of tundra brought the steadily stiffening owl bodies into Frankie’s lab as well. Igor laid their winged bodies on the large work table, draped over Dusky Dillon. Then he waited in the corner, wringing his paws and waiting for his master to appear. At the stroke of midnight, the heavy, wooden door into the lab opened. A small figure with large, round ears stood silhouetted by the torchlight from outside. “Did you bring me the snow leopard?” he squeaked. Igor, shaking, pointed at the pile of bodies on the work table. The mouse approached, twitching his whiskers. He examined the leopard’s ruined face. Frankie’s own frown seemed nearly as terrible to Igor as the unnatural scowl torn into Dusky Dillon’s face by the enraged owl. Frankie lifted one of the owl’s wings and then another. Of the four wings, two were torn and bloodied; two looked all right. “I’m sorry, Master,” Igor blubbered, still huddling in the corner, paws clenched tightly together. He had no one else to hold his paw, so he held his own. Igor worked diligently under Frankie’s direction. He made precise cuts, severing the wings from one of the owls and the head from the other. Frankie admonished him constantly to hold the knife steady and avoid damaging the feathers. When they finished with the owls, Igor came face to face again with his failure to bring back a perfect deceased leopard for his master. Carefully, Igor sank Frankie’s sharpest knife into Dusky Dillon’s neck, sawing through muscle and bone. He removed her disfigured head, rendering her feline body once again perfect but headless. Igor and his master worked through the dark hours of night and into the pale hours of early morning. With careful paws, Igor pushed and pulled a tiny, crescent-shaped needle through dead muscle, leaving a straight, dashed line of stitches. He used a thicker needle on Dusky Dillon’s spotted pelt, joining it to the owl’s feathered skin. He had to work the needle around the feather quills, leaving a jagged line of stitches. But the feathers would cover it. When Igor finished, he left the newly be-winged leopard body, headless, on the table. He approached his master, quietly so as not to disturb him, and stood behind his shoulder. Frankie’s work with the two brains must have been complicated, because he was still poking with tiny forceps at the mass of crenellated, pink flesh inside the open leopard skull. Igor saw a gleam amidst the bloody pink. Between two folds of the brain flesh, Frankie’s forceps held a small green square traced with intricate right-angled patterns in silver lines and miniscule gold rectangles. Frankie held the forceps with one paw; his other paw deftly stitched the pink flesh around the green square. The strange object disappeared into a pocket of Dusky Dillon’s brain. “Then sew the head on to the body?” Igor asked, feeling clever. Igor took the skull from Frankie. To repair the bone, he replaced the oval fragment that Frankie had cut free and sealed the crack around it with an amber-colored resin. When the resin hardened, it would be even stronger than the original bone. At least, that’s what Frankie had told him when they’d reconstructed a mangled mouse corpse the week before. Her bones may have been strong when the resurrection machine woke her up, but she’d been dead too long. Her brain never recovered. As Igor sewed Dusky Dillon’s new avian head in place, he wondered whether this gryphon would really be Dusky Dillon anymore. Her head was the owl’s head; perhaps, her name should be the owl’s name? But Igor didn’t know the name of the owl who’d attacked him. He finished stitching the line around Dusky Dillon’s neck, and then he put the needles, thread, and resin away. He could hear the powerful, electric whir of the resurrection machine now and the howling wind outside. The tundra had been calm only a few hours ago, but Frankie had the power to summon storms. A series of wind turbines above ground whipped the atmosphere into a low pressure frenzy, drawing down nimbus clouds and inviting lightning to strike their conducting rods. Frankie controlled the turbines from a panel of levers and switches on the side of the resurrection machine. A giant, tangled mess of wires and gears trailed down from the ceiling, hooked into Frankie’s control panel, and clumped around a simple wooden chair. Igor had awoken to his new life in that chair. Soon, Dusky Dillon would awake there as well. “Bring over the body,” Frankie squeaked. Igor grabbed Dusky Dillon by her leopard arms and draped her newly reconfigured body over his back as he had before. He dragged her across the room on his back, turned himself around, and awkwardly settled her corpse onto the wooden chair. She slumped forward when he disentangled himself, but she stayed on the chair. “Wire her up,” Frankie said. Igor lashed Dusky Dillon’s complicated frame to the chair using thick, black cords. He made sure not to crush her wings. He’d spent so much time carefully sewing them in place. Then he pulled down a skullcap from the tangle of wires above the chair. He affixed the cap, trailing all its wires, to her head and held it on with a leather strap looped under her new owl beak. Other wires hanging from the tangle above had metal cuffs at their ends. Igor tightened the cuffs around Dusky Dillon’s leopard arms and legs at intervals — ankle, calf, thigh, and wrist, forearm, bicep. “Done!” Igor said. He could hardly wait for Dusky Dillon to wake up. Once Frankie had another assistant, Igor wouldn’t have to sleep alone in the lab at night. He’d already fixed a cot up for her, next to his in the supply room. He could teach her how Frankie liked his assistants to behave — label alchemical supplies fastidiously; disinfect everything after working with a corpse; and never, ever go into Frankie’s laboratory office. He could talk to her about working for Frankie, and they could wonder together about the marvels in the ice castle and Frankie’s royal court. “Stand back,” Frankie squeaked, impatience in his voice. “Yes, well, hopefully that glitch will be fixed in this incarnation,” Frankie said. Then, he threw the switch that opened the conduits for the lightning. Sparks of blue fire jumped from the tangle of cords, and an electrical hum built up in the room. The skullcap on Dusky Dillon’s head glowed dully then brighter. The entire resurrection machine rattled like a restless spirit was trying to escape. Outside, the winds died down. “Time to come online,” Frankie said. Igor knew Frankie was speaking to himself but pretended the words were meant for him. “That’s right!” he agreed, even though he didn’t understand. Dusky Dillon blinked her yellow, owlish eyes. She clacked her beak, trying it out for the first time. “Master,” she said, her voice reedy and growly at the same time as her owl tongue and leopard vocal cords sorted themselves out. “Dillon,” the gryphon answered. Her voice gained strength, but it retained the growly undertone. “Bodyguard and loyal servant to the Great Frankie Mouse.” Her yellow eyes gleamed. How did she know that?, Igor wondered. 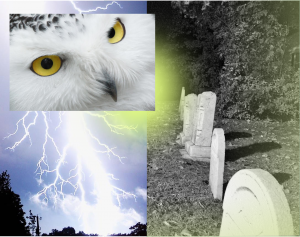 She’d never met Frankie before dying as either owl or leopard. Perhaps, she had heard of him and knew he was the only scientist in the region with the skills to resurrect her, and she guessed that he’d want a strong creature like her to be his bodyguard. That had to be it. As Igor loosened the metal cuffs around Dillon’s limbs, Frankie got his coat from his office. Dillon stood up and stretched her wings. The snowy white feathers on her head and wings blended beautifully into the thick pelt of white fur, covered in horseshoe patterns of soft gray, over the rest of her body. Igor stood in shock. One of Dillon’s feathers could have knocked him over. Or, if Frankie meant what he said, Dillon could simply order him to fall over, and he’d have to do it. “Master!” Igor cried, his canine voice rising into a whine. Igor always marveled at how Frankie could call his giant castle of ice simply “home.” He would love to treat the wonderful with such familiarity. He would love to experience the wonderful at all. Instead, he lived in a dank basement laboratory and had been demoted beneath a neophyte who couldn’t possibly know how his master liked things run. To his horror, though, Igor discovered over the following days that Dillon knew everything about running the lab and pleasing Frankie. She knew what Frankie wanted before he told her. In fact, Frankie hardly spoke to her, and he barely acknowledged Igor anymore. At first, Igor resented Dillon for displacing him, but then his lonely, pack animal heart cleaved to her — the only creature available to give him society and solace. His sullen attitude towards her turned solicitous, and he sought her friendship at every turn. “How do you know that?” Igor asked. He and Dillon had been alone in the lab all day, tending and titrating Frankie’s experiments. Neither of them had gone anywhere or had contact with anyone besides each other. Exasperated, Igor wanted to yip at Dillon, “It does matter! And how can you possibly know that Frankie wants us to go dig up those mice? He hasn’t been into the lab in three days. Are you simply guessing?” Admittedly, it was an easy guess that Frankie would want fresh mouse corpses in perfect condition from a clean death by poison. Igor and Dillon trudged across the tundra, their way lit by two gas lanterns hung on the rickety cart they took turns pulling. Dillon’s wings were beautiful, but they weren’t strong enough to lift a leopard body. She couldn’t fly. Two hours to Izerberg. Five hours digging, breaking open coffins, and carefully laying out the mouse corpses in a pile on the cart. All the while, an oppressive silence weighed Igor down. He wanted the cheer of companionable chatter, but he feared anything he could say would be met with the judgmental glare of yellow eyes. After two hours trudging toward home with a heavy cart of dead mice slowing them down, the sun broke above Frankie’s castle on the horizon. The parapets and towers glowed pink and crimson. It looked like a castle built from dawn itself. A long moment passed, and the quality of the silence between Igor and Dillon changed. Igor stopped pulling the cart. He turned to stare at Dillon. Her leopard body and half-folded wings dwarfed him, but her owl head looked small. “There is only one castle!” Igor said with frustration. The castle was the most beautiful thing in his world, the center of all his hopes and dreams — and Dillon was blind to it. He couldn’t share it with her, and, worse, he feared that her blindness meant there was something wrong with her. Had combining two bodies mangled her soul? Was the castle truly heaven, visible only to the pure of heart? Maybe Dusky Dillon’s bad deeds in life — worse than his own, for sure — were enough to sentence her to damnation without the hope of Frankie’s castle. They walked the rest of the way in silence, trading turns at pulling the cart. When they reached the lab, Dillon and Igor unloaded the mouse bodies and arranged them carefully on the work tables like little dolls. Five mice fit easily on the table that had been barely large enough for Dillon’s hulking girth on the night Igor brought her in pieces from the graveyard. Igor frowned. He felt so little warmth from Dillon. It wasn’t that she seemed cold to him… But, perhaps, cold to everything? Frankie had brought her back from the dead, but she still seemed dead inside. “I think I’ll stay up and see Frankie,” he said. “No. You need to sleep.” Dillon stared at Igor until he lowered his ears; his tail drooped; and he slunk off to his cot in the supply room. Dillon watched closely as he pulled his thin wool blanket over his fur. He turned his back to her and listened as she got into her own cot. He felt sure that her yellow eyes still watched him. Igor pretended to sleep but kept himself awake by filling his mind with stories about the mice waiting on the laboratory tables to be resurrected. Two of them, buried in matching coffins beside each other, would awake and embrace, glad to find themselves together again. The littlest corpse would awaken still a child and sentenced to forever be one — she would charm Frankie with her innocent heart, and he would make her his Lady-in-Waiting. She would bring Frankie his fine wines and candied chestnuts, and, unable to resist, he would share the sweets with her. The lock on the lab door clanked, and the door whined, swinging open. Frankie had come! Igor’s heart pounded with excitement, but he forced himself to creep, slowly and silently, from his cot. Dillon didn’t move; she hadn’t heard him. Step by painstaking step, Igor placed his padded paws on the stone floor, careful to keep his claws from scraping. By the time he’d closed the door to the supply room behind him, Frankie was already standing over the work table of mouse corpses. Igor approached and saw that Frankie had opened the skull of the child corpse he’d been daydreaming about. Light flashed off a pair of needle-thin metal forceps that Frankie had pressed into the pink flesh of her brain. Igor thought he saw another of the green squares that Frankie had put in Dillon’s brain. “Was her brain damaged by the poison?” Igor asked. Frankie jumped and squeaked. When he turned and saw Igor, Frankie glared, and his whiskers turned down, trembling in anger. “This is delicate work. You should know better than to startle me.” Frankie turned back to the child corpse’s open brain and withdrew the forceps. If there had been a green square held in the forceps, it was gone now, lodged in the brain. Frankie folded back the sawn open skull and began applying resin to the seam. “Besides, shouldn’t you be sleeping? Dillon told you to, didn’t she?” Frankie’s tone changed from anger nearly to indifference. Igor was not the smartest fox, but he could tell when he was being lied to, especially when his master didn’t respect him enough to hide it. “Yes, Master,” he said, but his heart screamed in anguish and raced with adrenaline. He meant to go back to his cot, but his paws carried him to the front door of the lab. He stood outside the lab and stared up at the castle, glittering and glorious in the light of day. He walked beside the icy wall, heading toward the castle’s main gate. Steam rose from the glossy vertical surface in the beating of the sun, and his reflection kept him cold company. He was tempted to touch the ice with his paw, but when he reached toward it — courage failed him. Perfect beauty should not be marred with paw prints. That would be hubris. At the main gate, no one stood guard. There were no mice in armor, but, surely, a strong castle like Frankie’s didn’t need guards. Ice walls were defense enough. Igor called again and again. His cries turned from pleas for entry into the pouring out of his soul to a closed gate of ice. The sun rose higher in the sky, and Igor’s cries gave way to soft whimpering and, finally, curled up on the ground beside the pure beauty of the castle, sleep. He was as tired and in need of sleep as Dillon and Frankie had told him he was. Igor awoke from incoherent dreams of disappointment and betrayal to a cold wind ruffling his fur. Many hours must have passed while he slept for the sun was much lower in the sky and marred by clouds. The clouds grew and darkened as Igor watched them. Frankie must have been powering up the resurrection machine, ready to bring back to life the poisoned mice. Igor lifted himself from the cold ground and limped away from the castle gate, shoulders hunched to protect himself from the wind and rain of the growing storm. With dripping fur and raindrops in his whiskers, he descended the stone stairway to the lab and slipped inside as quietly as a gimped fox could. On his way to the supply room and his cot, he stopped to dry himself with an old work rag. As he rubbed down his white fur, Igor saw the blue sparks and dull glow of the resurrection machine coming to life. He moved closer to watch. Shortly afterward, the first of the poisoned mice came to life in it. Igor meant to go straight to his cot after drying his fur, but he stood mesmerized, watching as Frankie helped the newly resurrected mouse out of the machine. Then, one after another, Frankie resurrected the others until all the corpses on the tables were gone; instead a ring of re-animated mice sat around Frankie, awaiting his commands. They didn’t look like courtiers and ladies-in-waiting in Igor’s mind’s eye anymore. The tilt of their heads, the bearing in their shoulders, and the stern, grim expressions on their faces… They looked like soldiers. Frankie didn’t think they’d be able to see the ice castle either, let alone live, drink, dance, and be merry in it. Thoroughly shaken, Igor returned to his cot and wondered why Frankie needed an army. He trusted his master and wanted to help, but his master did not trust him. Perhaps Frankie was protecting Igor’s feelings, hiding some grave danger from him. In spite of the adrenaline coursing through his body, Igor must have fallen asleep again for he woke up to Dillon’s giant, feline paw on his shoulder. For the next ten days, their schedule stayed the same: they robbed graves all night, slept all day, and then Igor awoke to the news of more poisoned mice. The hard work left very little time for speculation, but Igor couldn’t help feeling that all the toxic well water couldn’t be a coincidence. Was this the danger that Frankie was protecting him from? Had a plague struck the land? Igor didn’t know how soldiers could fight a plague, but, by now, Frankie’s army was more than one hundred strong, a formidable force and still growing. Finally, a day came when Igor woke up in his own time. He lay in his cot, relishing the indolence after weeks of constant hard work. He used the time to come to a few decisions. First of all, he needed to figure out how to help Frankie better, and, as little as he liked it, that meant snooping through Frankie’s secret office. It was against Frankie’s orders, but Frankie had given him no choice. He knew he could help more than as a simple laborer. He would prove that to Frankie, and then Frankie would be grateful. Secondly, Dillon had to see the castle. It was one thing to miss it at night on the horizon. Surely, in the shining whiteness of daylight on the tundra, standing right beside the castle’s walls, she couldn’t miss its majestic glory. Breaking into Frankie’s office would be easy. He just needed to get Dillon out of the way so that she wouldn’t tell on him. When Igor got up, he found Dillon hunched over one of the work tables. A re-animated mouse sat beside her, and spread in front of them were piles of green boards and spools of silver and gold wire. Dillon used a utility knife in her giant paws to cut the boards down to tiny squares. The mouse took the tiny squares and soldered intricate patterns onto them with the spools of wire. Their concentration was so complete that Igor considered breaking into Frankie’s office right then, but it would be safer if the lab were empty. Dillon and the mouse looked up. “Where are the other mice?” Igor asked. Frankie resurrected new mice every night, and then they disappeared with him. Svetlana was the first one Igor had met after her reanimation. “Working for Master,” Svetlana said, returning to her work. “Building barracks.” Svetlana didn’t even raise her eyes to look at him while answering. Svetlana didn’t answer him. Dillon shook her head, almost imperceptibly. They kept working on the mysterious green chips. Igor’s heart sank as he realized that Svetlana didn’t know about the castle either. If a perfectly normal mouse like her wasn’t good enough to enter Frankie’s castle, what hope was there for him? But even if Frankie wouldn’t invite them into his glittering court, Dillon and Svetlana deserved to see it. No one should be denied the sight of heaven, even if they were denied entrance. Svetlana and Dillon might not obey him, but they would obey their master. “Frankie told me to take you there,” Igor said. “You haven’t seen our master today,” Svetlana said, reasonably. “Why not?” Igor cried in outrage. What special connection did Dillon share with Frankie that Igor had no part of? “Your mind isn’t linked,” Dillon said. Igor didn’t know what that meant, but he could see his deception was getting him nowhere. Words fall behind actions. Igor sized up the situation: Dillon was much larger than him, but he could outrun her with the head start afforded by surprise. He rushed around the table, grabbed Svetlana with one arm around her middle, and ran with her under that arm for the lab’s door. To slow Dillon down, he slammed the door behind him before rushing up the stone stairs and into the bright, white tundra day. “There!” he screamed, pointing with his free paw. “There’s the castle!” He threw Svetlana at the snowy ground at the base of the castle wall. She whimpered, but Igor couldn’t make out the words. “What?” he snarled, showing his sharp, canine teeth. “I see nothing!” she squeaked before hiding her face in her paws. In desperation, Igor threw himself at the castle wall, needing to feel its solid, smooth ice against his paws. As his body reached the wall, a bright flash blinded him. He felt nothing with his paws, but his body rushed forward into empty space; unbalanced, he toppled and slammed into the ground. All around him, all he saw was white — uniform and blinding. He reached up, trying to discover anything but emptiness and the ground under him, but his paws felt nothing, and, worse, he couldn’t even see his paws. “What happened? Am I in the castle?” It must have been a trap door in the ice wall, a secret entrance. “Am I inside?” His excitement rose. He could hear Svetlana and Dillon behind him. “Come in! Tell me what you can see!” The glory of the castle was too great for his poor eyes, but, surely, a blameless mouse like Svetlana, a mere victim of a poisoned well, would be able to see. Igor stood up, held his paws in front of him, and carefully walked forward. He took small, shuffling steps. He felt Svetlana come up beside him and take one of his paws in her delicate mouse hands. “The old marble quarry,” Svetlana said. Svetlana described the angular gashes cut into the Earth, the rubble, and the dingy, haphazard barracks being built by the reanimated mice way down on the quarry’s floor. She didn’t see heaven; her eyes saw a bleak, labor-filled hell. “That can’t be right,” Igor said. “Where are the dancing mice? The hares playing music? The fancy-dressed voles?” But he let Svetlana lead him away, back toward the lab. Suddenly, his vision returned. When he looked over his shoulder, the glittering castle wall towered behind him. For the rest of the day, Igor lay on his cot, staring at the gray ceiling, listening to Dillon and Svetlana construct chips in the lab, and remembering the bright whiteness that had filled his eyes inside Frankie’s castle. When night came, Svetlana left the lab, presumably to join the other reanimated mice at the barracks she’d described. Or in the castle she couldn’t see. Dillon joined Igor in the supply room. Igor intoned dully, “Yes, Dillon.” Then he waited until he heard her breathing slow into sleep. Igor had failed to show Dillon the castle, but he could still break into Frankie’s office. Perhaps he could find answers to the castle mystery there, as well as clues to Frankie’s plans. Igor moved slowly and silently. He had all night, and he couldn’t risk Dillon hearing him. He worked his way through the lab in the dark, not daring to risk turning the lights on. The darkness reminded him of the whiteness inside the castle, and he pretended that he was there — perhaps in the kitchen, preparing a secret meal for Frankie to surprise him. Igor felt blindly through the small drawers in the work tables until he found the set of needles. He selected the heavy, curved needle that he’d used to sew Dillon’s wings on and a thin, metal rod. Then, he made his way to Frankie’s office door. He inserted the metal rod and needle in the lock and patiently wiggled the needle until he heard a tiny click, then another, then four more. He turned the rod, and he was in. Once the door was safely shut behind him, Igor reached up and felt above him for a pull string. He found one, pulled it, and the small room filled with light. Igor stared in confusion at the single chair, desk, and contraption on the desk. Frankie had wired a typewriter up to a large metal box with a black glass window on one side. Several smaller boxes on the desk, wired into the typewriter as well, blinked at Igor with tiny colored lights in red and green. Tentatively, Igor approached the desk and sat in the chair. He put his paws to the keys of the typewriter, and, as if the contraption had sensed his presence, the black glass window leapt to life with scrolling, white text. Igor knew how to read, but a lot of the letters on the black glass didn’t make real words. Though, he recognized his name as well as Dillon’s and Svetlana’s, and a bunch of other names that must be the other reanimated mice. Intrigued, he hunted out the letters of his own name on the typewriter — I, G, O, R.
As soon as he pressed the “R” key, the writing on the glass changed completely. Most of it, he didn’t understand this time, but buried in the jumble of nonsense words, he saw the word “CASTLE.” With rising excitement, he typed that word, too. Again, the writing on the glass changed. This time, he understood a lot of it — ICE, SPARKLING, GLITTERING, DANCING, MUSIC, FEAST, VELVET, RUFFLES. These words described everything that he knew existed but couldn’t see. Everything that Dillon and Svetlana didn’t even believe in. For several minutes, Igor simply stared at the black glass, dreaming about Frankie’s castle. He hadn’t learned anything yet about Frankie’s plans, but Igor knew that what he had discovered was important. He just didn’t know how. Eventually, the glamour of the words on the black glass window wore off, and Frankie opened all the drawers in the desk, hoping to find something more clearly useful. Instead, he found broken wind-up toys, a brush for Frankie’s fur, a hidden stash of chocolate, and a bunch of crumpled wrappers — all the useless debris of a long-used, rarely cleaned desk. In the bottom drawer, he found a stash of papers. Most of them were maps. A few looked like ancient letters Frankie had written and never sent. But one was a cryptic list of words. That caught Igor’s attention. Much like the words on the black glass window, the words written on this list didn’t quite make sense, and many of them were mixed with strange symbols he didn’t recognize. Though, looking at the typewriter, he saw that each of the strange symbols could be found on one of the keys. He decided to try typing a few of the words and see what happened. The words that most appealed to him were: COPY SCREEN and UNIVERSAL OVERWRITE. After he typed COPY SCREEN, the white text describing Frankie’s castle flashed into reverse letters — each letter a little white box with blackness in the shape of the letter inside. It made Igor think of the whiteness inside Frankie’s castle again, and he felt sure that what he was doing must be right. He typed UNIVERSAL OVERWRITE, and suddenly the list of names from before began streaming over the glass. The red and green lights on one of the metal boxes wired into the side of the typewriter began blinking furiously, and Igor heard a sound like an electronic nightingale choking to death. He turned back his ears to dim the offensive noise. Unsure what any of the contraption’s behavior meant, Igor returned to studying the papers he’d found in Frankie’s desk. Several of the maps were marked up with red circles, arrows, and lines. Perhaps they indicated plans for an impending battle with a neighboring province. The largest map indicated that a moose king inhabited a castle to the north, and Igor lost himself poring over the strange squiggles that Frankie had drawn there. He didn’t like the idea of going to war with a kingdom of moose; they were literal giants compared to mice and even foxes. But it would explain why Frankie needed so many reanimated followers. “What are you doing!” Frankie Mouse squeaked behind him. If Frankie had been larger, Igor felt sure the mouse would have struck him. Fury and outrage burned in his rodent eyes. Igor stood from the chair to show his full height. Frankie might be his master, but loyalty should earn respect. And Igor had never been anything but loyal. “Are we at war with the moose king?” Igor asked. Frankie continued ranting, but Igor hardly heard him. He couldn’t shake the image Frankie had described from his head. Was it possible that Frankie couldn’t see his own castle? Mouse and fox stared at each other, each lost in a deep well of emotions. Igor hadn’t realized there was a chip in his brain as well. He didn’t know what to make of that. Igor’s paws clenched into fists and his tail swished. “No,” he said, heart racing at the thought that he was defying his master. “The castle is real.” There was nothing else he believed so firmly. “And if the mice are dancing, then they can finally see it. I won’t let you take it away from them.” More importantly, Igor realized, he needed to make Frankie see the castle as well. The look of sadness on Dillon’s face transcended her avian features. She clearly felt deeply the tragedy of any impairment that would deny her master the experience of his shining, glittering castle of ice. “I think we can help him,” Igor said. “We must.” Dillon’s voice grew husky with emotion. Frankie tried to move away from the two predators, his faithful minions, who had him cornered, but Dillon’s leopard bulk and spread wings blocked the door, and the office was small. “No!” Frankie screamed, launching himself toward his desk. Briefly, his mouse paws brushed the keys of the typewriter, but leopard paws grabbed him firmly around the waist. “Bring him to a work table,” Igor said. Dillon carried Frankie, kicking and squeaking, into the main room of the lab. She flapped her wings as she shoved him down on a work table. The look in Frankie’s eyes as Dillon held him down on the table told Igor he was right. Frankie had poisoned those wells. “I’m your master,” Frankie said. His voice was frantic, terrified. “You love me.” He looked from Igor to Dillon, appealing to both, but Dillon believed in the castle now. She would follow Igor. Igor’s eyes turned soft, and he came close enough to take Frankie’s small paw in his larger one. He clasped it firmly; fox paw and mouse hand intertwined as one. “Of course, I love you,” Igor said. Dillon continued to restrain him with her heavy feline paws, yet, for a moment, Frankie looked relieved. Then, Igor let go of his paw and picked up a bone saw. “Opening my skull will kill me!” Frankie squeaked. All that Igor could think was that his old life didn’t sound much like it was worth remembering. Besides, a few memories were a small price to pay for the heavenly vision of Frankie’s ice castle. Frankie would understand that soon. Then, they could get back to the important work of bringing Frankie’s vision to all the other creatures — mice, voles, hares, foxes, and someday moose — in their land. Igor lowered the bone saw toward Frankie’s head. Previous Previous post: Furry Book Month — Week 2! Next Next post: Furry Book Month — Week 3!